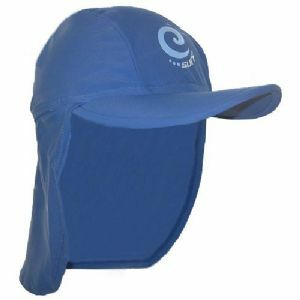 This is a great UV Legionnaire style cap with UPF 50+ Sun Protection. It has a wide brim to keep the sun out of the face and help protect the eyes. Designed to be worn in and out of the water for maximum sun protection. The Kidz Swimmers Blue Surf UV Legionnaire Cap is available in size S - age approximately 3-6 years, size M - age approximately 6-10 years and size L - age approximately 10 years plus. Match these caps with our Boys UV Sunsuits or Rash Vest & Swim Trunks for a total sun protection package.